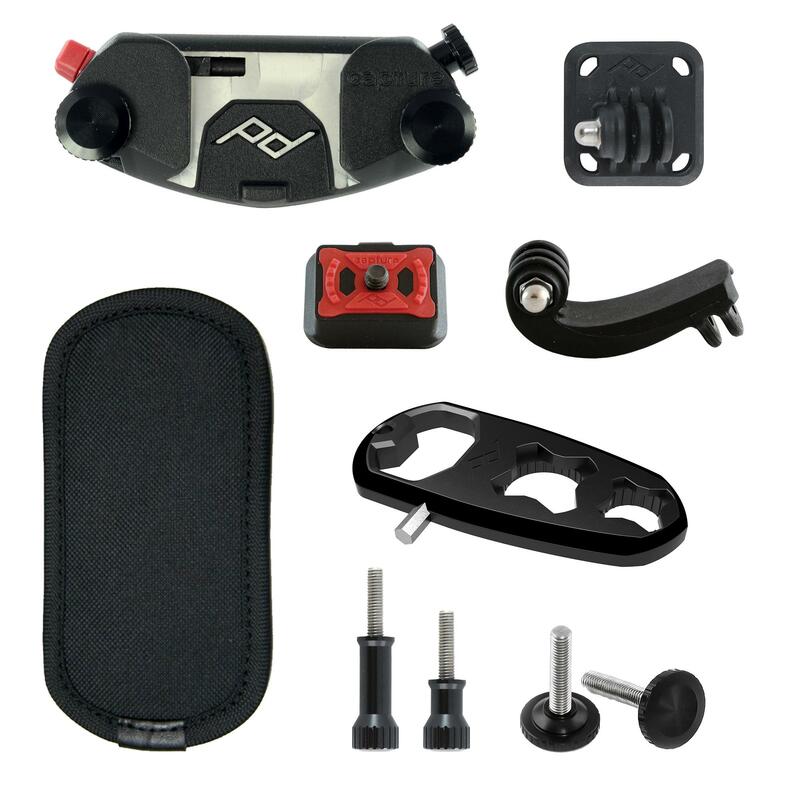 Capture® POV Camera Clip is the most versatile action camera mount ever created. The Capture POV (Point of View) Camera Clip lets you mount GoPro®, Sony® ActionCam, Contour® and other action cameras directly on a backpack or strap. With an ultra-light, streamlined design, and quick release button with safety lock, this also works well with point-and-shoot cameras. The aluminum and glass-reinforced nylon construction of the Capture POV Camera Clip makes it incredibly strong and durable. The Capture® Camera Clip System rigidly holds your camera to any strap or belt, keeping it secure and accessible during any physical activity, so you can take your DSLR camera everywhere. Capture® is an aluminium clip that will forever change the way you shoot. It lets you carry your DSLR, compact, or POV camera, with lens attached, directly on any backpack strap or belt. It holds your camera rigidly, allowing you to be physically active without your camera swinging and swaying. While this eliminates the need for a neck strap, sling, holster you may like to use it in conjunction with the Leash or Cuff. Screw the quick release plate into the tripod mount on your point-and-shoot camera using an Allen key or attach the POV plate to the 'J' arm and POV housing. Clamp the aluminium clip around any backpack, strap or belt - up to 7.6cm (3") wide - using two hand-tightened bolts. Slide your POV or point-and-shoot camera plate into the clip. Your camera locks into place, keeping it secure as you move around. Access your camera instantly by pressing the quick-release button. Capture is the most versatile camera carrying solution ever created - it attaches to any belt, backpack, messenger bag, climbing harness, baby carrier and more. Unlike straps, Capture holds your camera rigidly, allowing you to do extreme activities without your camera swinging into harm’s way. All that in a sleek little package that is smaller and lighter than an iPhone. Any camera owner who is on their feet when they are shooting; From pros like journalists and wedding photographers to hobbyists that enjoy activities like hiking, skiing, climbing and motorcycling, Capture is a revolutionary solution to a universal pain-point. x1 Allows you to tightly clamp down your bolts for extra bumpy rides. Also it opens beer bottles! Peak Design’s goal was to create a product with such enduring utility and durability that it will never find a landfill…or even a recycling centre (though all parts are recyclable). It is their opinion that garbage stinks.